2-AG is the most abundant endocannabinoid. 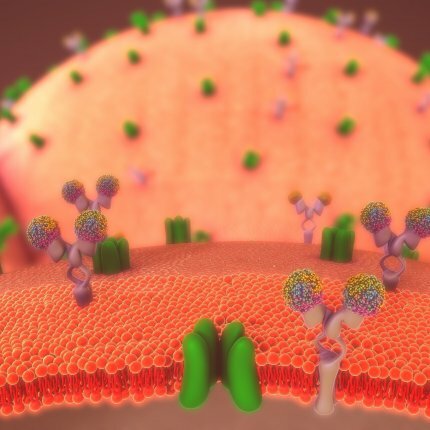 It is derived from the lipid membrane that separates a cell from its environment — a cell will cut 2-AG out of its membrane, allowing the molecule to drift to neighboring cells. Upon meeting those neighbors, it slips into their membrane, where it binds to cannabinoid receptors and communicates a message. Those neighboring cells don’t send 2-AG back after the message is received, but instead cut up 2-AG to terminate the signal. An enzyme called ABHD6 is gaining recognition as an important regulator of 2-AG levels. Nephi Stella and other researchers at the University of Washington recently reviewed its role in endocannabinoid signaling. Although ABHD6 is not the major 2-AG-metabolizing enzyme, it is active in the immune system and certain brain cells. In neurons, it sits on the side producing 2-AG, helping to ensure that the cannabinoid sends information in the right direction. ABHD6 mediates the synaptic plasticity caused by cannabinoids, wherein the brain weakens connections that are no longer used. ABHD6 may do this by regulating the movement of key neurotransmitter receptors. Besides metabolizing cannabinoids, it can also attach to non-cannabinoid receptors and pull them inside the cell. There’s still a lot unknown about ABHD6; it is targeted by the Epstein-Barr virus (causing Mono) and is dysregulated in Lupus, cancer, and other diseases. Future research on ABHD6 is worth looking out for.